To ensure that the first course is straight and level, snap a level chalk line on the wall to indicate the top of the first row of stone. Stone accent wall: cover a wall with stone veneer and transform a room! 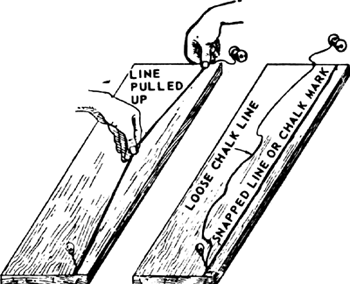 Added to the pastel is "straightline chalk," which comes in a variety of sizes and is normally used to create chalk lines in construction. If the chalk line is broken, the V-pack may not be sealing correctly. Of the twelve Chalk Line essays, eight originally appeared in a special issue of that Temple of Postmodernism, Social Text. Mark the point and draw a chalk line across the wall using the spirit level to make sure it stays straight. Cut up the middle of the inverted V and iron back on the chalk line and pin. The students were fascinated as Carl used his professional chalk line to draw lines on the plywood where he would cut with the saw. The very technique that produces a clear, perfect line also yields an incredibly complex and delicate facture through finger-rubbed peripheries and loose pigment scattered with the release of the taut chalk line. Extend the line by stretching a chalk line and aligning it with both marks (Photo 2).